Pope Francis’ announcement that he will canonize the Franciscan missionary Junípero Serra, founder and father president of the mission system of Alta California from 1769 to his death in 1784, has fortuitously coincided with the recent appearance of three biographies of this controversial figure: Steven W. Hackel’s Junípero Serra: California’s Founding Father (2013), Gregory Orfalea’s Journey to the Sun: Junípero Serra’s Dream and the Founding of California (2014), and this latest and most sumptuously produced biography by a husband-and-wife research and writing team on the faculty of Santa Clara University, a Jesuit institution whose campus is centered on the reconstructed Mission Santa Clara de Asís (1777). These three biographies—successors to the two-volume biography (1959) by the Franciscan historian Maynard Geiger and the four-volume edition (1955-1966) of Serra’s writings by the Franciscan scholar Antonine Tibesar—by and large take an even-handed approach to a figure enmeshed in controversy since the revisionist 1960s. 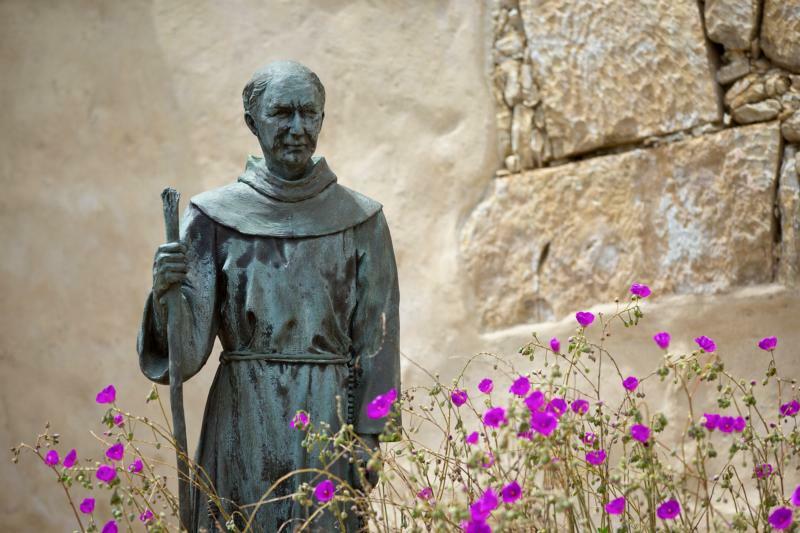 Prior to the 1960s, Junípero Serra enjoyed widespread approval in California as the saintly founder of Euro-California. In 1931 the state legislature selected Serra as one of two Californians to represent California in the Hall of Statuary in the Capitol in Washington, D.C., the other being the Unitarian minister Thomas Starr King (1824–64), Serra’s counterpart in the subsequent founding of Anglo-American Protestant California. In 1933 the popular Catholic writer Anges Repplier issued a best-selling biography chronicling Serra not only as a founder but as a saint; and the following year the Diocese of Monterey-Fresno formally initiated Serra’s cause for canonization. Fifty-two years passed before St. John Paul II declared Serra venerable in 1986 and blessed in 1988. Since that time, Serra’s cause for canonization seems to have languished until Pope Francis’ unexpected and unilateral declaration of intent. Even if one has no opportunity to review the secret procedures of the Congregation for the Causes of Saints, it is reasonable for one to speculate that at some point in the canonization process, most likely in the past 30 years, the emerging revisionist interpretation of Serra and the California mission system by scholars, Catholic and non-Catholic alike, slowed down, if not outright derailed, Serra’s cause until the recent ukase by Pope Francis. There were just too many paradoxes and contradictions in Serra and the mission system he founded for the unalloyed chorus of praise to continue. Serra’s medieval asceticism (it included a lifelong preference for self-inflicted whipping and a morbid preference for pain) proved disturbing to contemporary psychological insight and led to speculations that Serra was perhaps trying to lash from himself a possible ancestral Jewishness that had delayed his acceptance into the order by the Franciscans of Majorca. Then there was his role as an agent of the Inquisition during his tenure as a missionary in Mexico, followed by his endorsement of physical punishment for recalcitrant Indian neophytes, along with his quarrelsome relationship to civil authorities and hostility to the settlement of Mexican Catholic laity in an Alta California that Serra wished to preserve as a Franciscan protectorate. Although they did their best to conceal their resentment, Jesuit scholars found it troublesome that Serra and his confreres seemed so eager to replace the Society of Jesus in the staffing of the California mission system and offered little if any support to more than 650 Jesuits arrested and force-marched into exile in 1767, many of them dying on this particular trail of tears. From the point of view of the scholars of recent decades, the mission system created by Serra and his confreres constituted a colonialist suppression of an indigenous people of a first order of magnitude. Native peoples, these scholars pointed out, were forced into missions, retrieved by soldiers if they escaped, regulated and indoctrinated with little if any regard for inculturation, devastated by European diseases and baptized on a wholesale basis with little or no true knowledge of Catholicism. The Franciscans performing these baptisms were followers of the medieval Franciscan philosopher Duns Scotus, who taught that since the finite was possessed of an innate drive toward the Infinite (with a capital I, meaning God), Native Americans were almost immediately capable of grasping and assenting to the existence of a supreme being and the intricacies of the religion, even if presented with little effort for inculturation. Baptism alone was necessary, and hence the Franciscans trumpeted their alleged success with mere statistics of baptisms performed. The mission system was supposed over time to produce a Christianized and Hispanicized Indian laity capable of making the transition from living in the mission system, which would be secularized, to living independently in a diocesan system similar to that which was developing in the rest of Latin America. But that never happened. The Franciscans never surrendered their protectorate, and the Native American population of Alta California—300,000 at the time of Serra’s arrival in 1769—had been reduced by half by the time the mission system was secularized by the civil government of Mexico starting in the mid-1830s. Over the past quarter century, Beebe and Senkewicz have been the respected leaders of a counter-revisionist and more even-handed approach to the Hispanic colonial experience in Alta California. Avoiding a return to prior pietism while remaining appreciative of the best possibilities of Hispanic culture and Catholicism, Beebe and Senkewicz have created an impressive canon of interpretation built upon the scholarship of the Franciscans Geiger and Tibesar, the monumental explorations of the Methodist scholar Herbert Eugene Bolton of the University of California, Berkeley, and the post-revisionist approach of the recently deceased University of San Francisco history professor W. Michael Mathes, to whom their book is dedicated. Do not use either Serra or the mission system to fight contemporary battles, these scholars have urged and practiced through their writings. Do your best to approach the past on its own terms and not as an occasion for sloganeering. Pay attention to the evolution of Spanish colonial civilization in terms of its achievements as well as its deficiencies. No era is perfect, including our own. Practicing an exhaustive and appreciative scholarship when appreciation is justified—as well as an evenhanded acknowledgement of deficiencies when such deficiencies are encountered—Beebe and Senkewicz have compiled a biography of Serra that is also an anthology of his freshly translated letters that allow him to make his own case: all this set in the realities of Franciscan missionary culture in the late 18th century. Dominicans and Franciscans, it must be remembered, were among the first to denounce the genocidal effects of the colonization by Spain of the Caribbean in the 16th century. The Franciscans were especially eager to redeem this performance in the missions they established in Florida, Texas and Alta California. Like the Jesuit missionaries in Baja California, Serra and his confreres distrusted civilian development in part because they were attempting to avoid the exploitation of vulnerable Indians. Serra was particularly outraged by the sexual exploitation of Indian women by Spanish soldiers and made a special trip to Mexico City to protest this behavior and ask for countermeasures. True, in terms of developing a Hispanicized Catholic laity within a reasonable time frame and transferring to that laity the mission properties as called for by the Laws of the Indies, the California mission system must be judged a failure. In terms of the anthropological and physical damage done to the Native Americans of California, the failure of the mission system was compounded into tragedy. But let us also remember that those 150,000 Native Americans who survived the mission system to emerge into the American era were reduced by their encounter with American California—by state-sponsored ethnic cleansing, by de facto slavery, by depredations of every sort—to some 30 to 40 thousand survivors by the time that Ishi emerged from the forest in 1911, the last Native American of California to live his life in the manner of his ancestors. Perhaps that is what Pope Francis is trying to suggest by pre-emptively canonizing Junípero Serra. Saints do not have to be perfect. Nobody is perfect. Sanctity is just another mode of imperfection. Nor do good intentions guarantee good outcomes. Intended to protect Native Americans, the mission system helped reduce the Native American population by half. Even good intentions, moreover, are inevitably mixed with self-interest. Displaced by diocesan clergy in the rest of Latin America, the Franciscans were seeking a new lease on life on the Spanish Borderlands. Be humble, therefore, in the face of history. All human culture, including the human culture of the Catholic Church, is by definition flawed and uncertain in outcome. When Pope Francis raises Junípero Serra to the altar later this year, Christian humility demands that he pay special tribute to the shared tribal sanctity, the martyrdom even, of those thousands of Native Americans now anonymously at rest in the unmarked graveyards of the California missions. That Serra's use of the discipline as an ascetical practice was a morbid preference for pain is pure supposition. The likely motive was a means of discipline for a spiritual purpose:overcoming the disorder sin introduced between body and soul. People in our society impose pain on themselves all the time for various purposes: training camps for sports, marathons, diets, boot camp,etc. Since many psychologists are irreligious or atheists or naturalists Christian ascetical purposes are per se morbid for them. That being said whether the discipline is a good ascetical practice is a different question. This article also appeared in print, under the headline "A Not-Perfect Saint," in the August 31-September 7, 2015 issue. Kevin Starr is a professor of history at the University of Southern California and the author of "Americans and the California Dream."